I bought my daughter some attractive Phonics Work Books from a stand at our local book store. I want her to get a head start on reading before she begins school, so I make her do them everyday. But it is like getting blood out of a stone! She drags her feet, whines, and shows no interest at all, even when I sit with her. What's wrong with my daughter? Giving kids a head start on reading is a wonderful idea. I think we should begin when they are babies. The very best way to do this is read aloud to them regularly from great children's literature. If you want some suggestions of books to try, there are wonderful blogs all over the kidlitosphere that offer reviews, and list books suitable for various ages. Or check back in the Book Chook blog archives for ones I've loved. The great thing about sharing books like this with your kids, is that it teaches them almost unconsciously. They learn to love stories. They absorb the rhythms and rhymes of language. They learn to predict, use contextual clues to find meaning, and delight in repetition and surprise. Read aloud time is an opportunity to have a beloved parent close and all to oneself, while being entertained by the magic of reading. There's little whining or dragging of feet. Phonics is one system we can use for helping readers work out words. Once kids understand that the squiggles on a page are letters, and those letters correspond with various sounds, they are beginning to build a method of "reading" an unknown word. It helps kids with writing and spelling, too. When children are ready to start reading independently, parents and teachers help them by referring to letters and the sounds they make. If a child wants to work out a word, sometimes identifying the sound/letter combinations can help eg "Oh look, there's 'cat' at the start of that word, then 'a', then 'pult'." Because we want kids to love reading, and be motivated to read, I am very reluctant to advocate any explicit teaching of reading before a child shows readiness. Surround your child in print, sure. Literacy activities in the form of games are fine. Reading aloud and modelling reading yourself are just wonderful. But buying workbooks for your child who doesn't want to do them seems to me fraught with the danger of turning a child away from reading. And that would be a tragedy. Wow, this is great advice, Susan. I think timing is important, and while it's a fantastic thing to have kids reading at a young age, you really don't want to force the issue. Like all learning, when you force it too much (you have to apply a little gentle pressure), kids begin to resent and hate it, and then you've defeated the purpose. As difficult as it is, I think it's best to cater learning to each individual child, and not pay undue attention to what other kids are doing, unless the situation is serious. Kids will do things if you just give them time. Our daughter was an early reader, but our son really resisted at first. Rather than force the issue, we just kept reading books to him, and gradually he started to show an interest in reading, and now is not averse to being taught. But we didn't force him, and he became interested on his own time. Just one more note-it's important not to give in to the path of least resistance and let them simply watch TV instead. 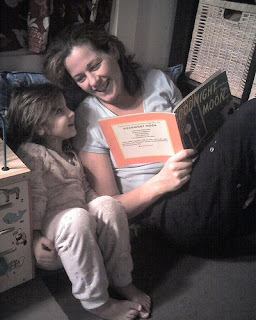 As you always promote, read to your kids, it will instill them with a love for books. Thanks for that excellent comment, Fred. I think you're right about catering to individual differences - not every approach works for each child. It's important to trust your instincts, read widely, and certainly not to give in to the path of least resistance. I know you and I prefer books over screens any old day! GREAT answer! Thank you from all the reading teachers in the world! My niece doesn't like anything that looks like work...but she does like being read to. This is a great, and important, post, Susan. I personally had a phase in which I enjoyed doing workbooks. But I was older, already knew how to read, and chose the activity myself. I agree so much that any activity that turns a kid off from reading is to be avoided. LOVE this ... we have books everywhere and reading is a big part of our lives, for ourselves and also reading to the children. This is why it is so important to read read read to children at every age because it becomes a part of who they are over time. My eldest was slow to read but loved books and loved having me read to him and eventually the combo of help at school and constant exposure at home helped him to become a strong reader. I see some kids anxious about it but because it was something we did every day together I think my son was more eager to work at it and while a bit anxious, definitely enthusiastic.... my middle child could read anything from the age of four - they all learn differently but if they love it it will come when it is meant to come. Just my opinion of course! Oh, Susan - I have been reading faithfully but life got wacky and I haven't been able to comment. Just wanted you to know I'm still enjoying your blog so much! I'm glad you think so, Mary Lee. Thank YOU for all you contribute to the literacy cause! Guest, I think that just about sums it up - kids love to be read to, and it works! You nailed it with the part about choosing it yourself, I think Jen. There is no one answer for all kids. I knew a four-year-old who used to like to copy out sections of the encyclopedia in his own printing. It's really hard to have the faith that reading aloud at home will work, Fiona. I know parents get anxious. There's a lot of pressure on kids to achieve earlier and earlier. I'm so glad your son has you on his side, continuing with the reading aloud and making it a cause for enthusiasm. Thanks, Fiona! Great you could visit today. I love this post! It's so true that things like workbooks can turn kids off to reading, especially at such early ages. They'll get enough of these in elementary school. Parents want to give their children every advantage possible, and even nursery schools are getting "academic" these days, but reading for enjoyment must come before the teaching of specific skills. I started taking my children to the library to find books, and to attend story time, from about the time they were 2 years old. Now, they're 11 and 13 and still love to find great books to read. If they have a book they like, they can each sit there reading for hours. It's a wonderful thing. Thanks for yet another inspiring post! I agree, Dawn. There are so many enriching experiences for kids - libraries, museums, parks, yards, trees, and so much we can make with them, or encourage them to create. Childhood is over so fast, I hate the thought of kids being pushed out of it. Once again, my friend, your answer is spot on. Introduction to books and sharing your passion and love of reading is what is important for a child. They will get enough pressure to be a student in school. Showing them the skills instead through reading interesting books will take the child so much further. I have watched countless children in my pre-k grow tired of books and learning already because their parents have them in Kumon Learning Centers and are pushing them so hard. If a child is over it at 4 and 5, you have a serious problem on your hands. Recent blog post: Winners of the Undress Me in the Temple of Heaven Giveaway! Rebecca, it breaks my heart to think of kids burning out so young. And for what? Is a child going to remember whether he scored 18/20 or 12/20 "-at" words? Or will he remember a deep and abiding love for stories? Welcome, Shanthy, and thank you!